Congratulations to Figaro Barber Shop at 9 Bedford Row who have won our monthly award for June, for their striking and beautifully maintained premises on one of Limerick’s busiest pedestrianized streets. Pictured outside the shop being presented with the award by Maura and Sharon is the proprietor Brian Hackett along with stylists Leanne Jones and Eric Hackett. Since we started presenting our monthly awards in January 2014, we seem to have more and more deserving candidates to choose from which is hugely positive from our perspective. However, businesses in busy pedestrianised areas of the city centre have a particular responsibility to maintain the appearance of their premises to the highest standard and Figaro Barber Shop on Bedford Row more than meets this criteria with its striking contemporary charcoal paintwork, attractive window features and signage, not forgetting of course the lovely bright barber poles which add a splash of colour to the exterior. Figaro Barber Shop was established in 1994 by Brian Hackett, a third generation award winning barber who has taken the traditional skills which are the cornerstone of barbering and blended them with new techniques and trends to achieve the perfect client focused modern barber shop. Staff at Figaro are trained by Brian himself and skills and techniques are constantly updated. Figaro Barber Shop offer consultations before cutting and a number of other services such as their specialist hot towel shave, beard shaping and colour. For more information please call them on 061 314943, visit their website www.figaro.ie or simply call in. 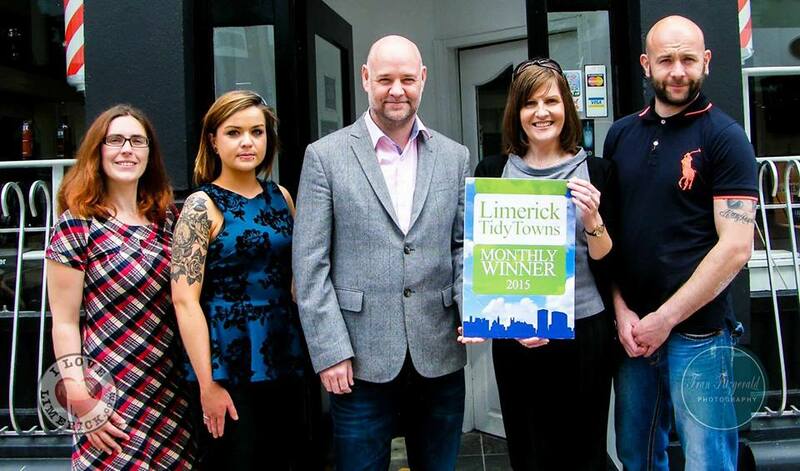 Figaro Barber Shop is the sixth recipient of Limerick Tidy Towns’ monthly awards for 2015, with The Stormy Teacup having won in January, Thomas Street Framing Centre in February, Bobby Byrne’s in March, Parnell Plaza in April and Combu b in May. An overall winner will also be chosen at the end of the year and if members of the public wish to suggest future monthly winners which they feel merit the award, please do let us know.